Users eager to jump right in may download the utility here. However, there are a few things unlockers should be aware of. Early Transformer Prime adopters must update their firmware to Android 4.x (Ice Cream Sandwich) before unlocking their boot loader. Most importantly however, users who choose to unlock their tablets will forfeit their warranties. Are there any legal issues Asus nullifying its warranty over unlocking? I wonder. To keep modders from getting too clever, Asus claims unlockers will also not be able to return their tablets to their original, factory pre-installed state. It won't be surprising if an unofficial method to do so appears, however. To the disappointment of the homebrew community, Asus released the Transformer Prime tablet in late December with a 128-bit encrypted boot loader. Efforts to root the device have been successful, however unlocking the boot loader has proven to be a difficult hurdle to jump. For those who aren't familiar with the difference between "rooting" and "unlocking" a device, the terms are different although not exactly mutually exclusive. When a device is rooted, that means hackers have found a way to gain full administrative rights on the device's operating system. This type of access is commonly referred to as a "super user" and gives users almost limitless power. Well, almost limitless power over everything but the boot loader. In the case of some devices like the Transformer Prime, the boot loader is programmed in such a way that it prevents loading third-party software through encryption and digital signatures. Since the boot loader is ultimately responsible for loading the operating system itself, an unlocked boot loader means users will finally have complete control over the device. 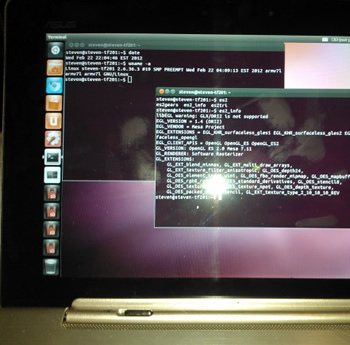 Somewhat unsurprisingly, ports of alternative operating systems like Ubuntu are already under way.